I'm a photographer. Since the digital age, and shutting down my darkroom, the question of making prints has become a central topic of discussion, not just for myself, but for photographers and the public in general. I bought a refurb HP 8750 on eBay, because HP claimed their Vivera dye inks had the longevity of pigments. Ha! The prints faded even in my portfolio case. So, I had to decide what to do. As long as I was researching inkjet printers, I decided to research the cost of ink. I'm still reeling. Now, let's calculate the cost of ink per gallon. Be sure you are sitting down, and have a bottle of Xanax handy. - a $30 HP #45 black ink cartridge gives you 42ml, pricing out to $0.71/ml. Meanwhile, blood apparently costs $200 for 500ml from the Red Cross, pricing out to $0.40/ml. - the BBC made these calculations: the average cost of a color HP cartridge is £29. This works out to £1.70 per millilitre. 1985 Dom Perignon costs 23p per milliliter. There are 100 pence to one British pound. In other words, ink costs 7.4x more than Dom Perignon. - from Mike Johnston's Online Photographer: makers essentially give you the printer and then charge you $3,785 per US gallon for ink (converted from the numbers provided by Ctein for the Epson 2880 ink price from Atlex at a price of $1 per ml). OPEC has got nothing over Epson. 2880 ink sells for approximately $159,000 per barrel (US petroleum). What's inside of that plastic shell that makes it more expensive than platinum? Primarily, water. Water makes up approximately 90 percent of the contents. Catalytic converters use platinum, palladium and rhodium, and are proportionately less expensive than ink. 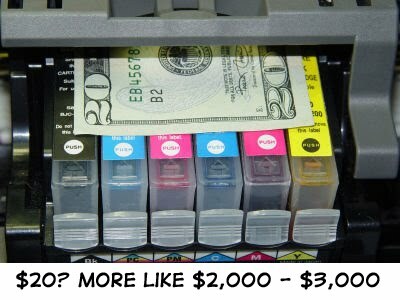 I googled an industry insider: "As an industry expert, I can tell you that the ink in a typical desktop printer cartridge costs the manufacturer from about one cent to a maximum of 25 cents. (Virtually all inkjet ink is purchased from independent ink manufacturers.)" The main article is, Why I've given up on the world's most expensive fluid. I have decided to buy enlargements from a lab. Kodak Endura and Ilford silver halide will last longer, and look better, than an inkjet. After test prints, ink and ink waste, they will also cost substantially less. Mike Johnston has another column on inkjet ink costs. Highly recommended. One thing neither of us covered is that, apart from subsidizing the cost of the printers (which you mentioned), the profits from the ink must also amortize the *development* costs of the printers. In the case of HP's "Z" series of printers, I believe I saw that quoted at 5 to 7 million dollars--for a product that has a definite lifespan and is something of a risk (HP lost money on its midline printers, which had too many problems and too many returns and warranty expenses to be profitable. So much so that rather than replace the B9180 and its siblings, it opted out of the mid-level printer market altogether). So the comparison to D-76 isn't really apropos, because presumably the only costs the sale prince of D-76 has to cover is the contents of the packaging and the marketing and stocking. And of course, in the "old days," there was a thriving subculture of people outraged by the high price of packaged chemicals. Patrick Dignan made a name for himself by "reverse engineering" the formulas of proprietary packaged chemistry [sic--that's what it was called, rather than the grammatical "chemicals"]. And many people "mixed their own" to avoid paying the high prices of the packaged versions. The numbers have gone up, because the costs have, but there's really not much that has changed.